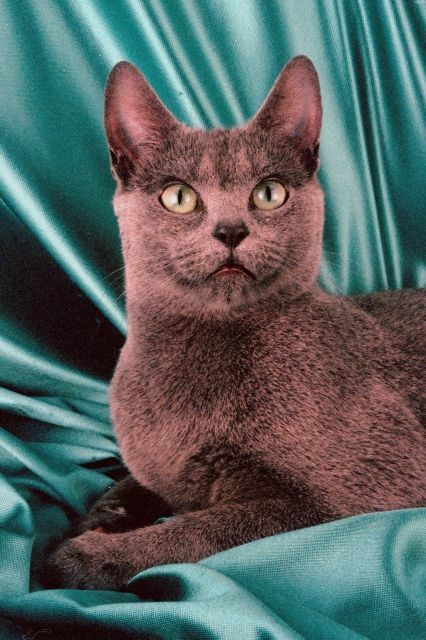 On this page We describe each and every member of our Russian Blue family. Anastasia in all her Glory, She is the Queen around our house and is the Main Dam that we have here on the ranch. We have been blessed with her. She has been a perfect mother, and an ideal show stopper. This would be our little princes Alexis, but I don't have a picture of her right now. She was shown for the first time at the 2001 TICA Annual and placed tenth in All breed kittens. Alexis, Has a new home now and very proud new parents, Pat and John of Arkady Cattery, in Omaha NE. Here she will be treated and loved for the princess she is. Victor, He is almost six months old in this picture. He loves to play and has placed forth in specialty breed at the TICA Annual 2001. As you can see Victor is just full of personality. He has shown once at the TICA Annual were he took forth place in Specialty division. He also took five first place out of twelve rings in the Russian Blue catagory. 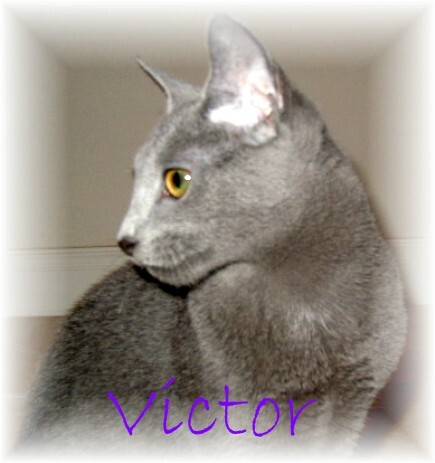 We feel that Victor will make a good run for Supior Grand Champion given the chance. He is up for addoption at this time and will be sold as an Alter Class. Please contact us for more information. This is our runt of the family. His name is Alexander and he is pictured here at four months old. As always, thier has got to be a runt in the family. Well this is it, little Alexander.. He is a dream boat just full of love and affection. 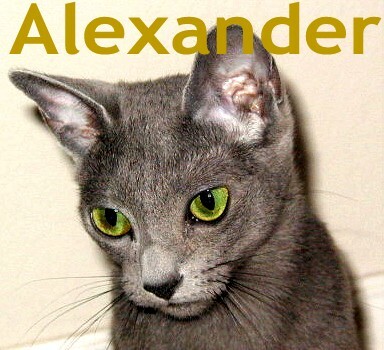 Unfortionitly Alex just doesn't have it in him to be a Champion show cat, but would make an excellent house hold pet, and could show in that catogary. He is up for addoption at this time.